I had the opportunity of traveling north to Gainesville for a lifestyle photography shoot for a GoRVing national advertising campaign. I also had the pleasure to work alongside Jeremy Pinckert, Creative Director at Explore Media out of Chicago, and Courtney Robey from GoRVing. Jeremy’s team shot the video for the GoRVing commercial while I took the photographs for the national print ads. “Find your away” is GoRVing’s current campaign. The focus is on how the RV can help you find your away and make memories, whether it’s far away, or around the corner. GoRVing is a division of the Recreation Vehicle Industry Association (RVIA). RVIA’s goal is to express how versatile an RV is. They want to challenge consumers to broaden their horizons when it comes to RV usage. An RV isn’t just a vehicle to get you from point A to point B on vacation. An RV is the gateway to a new lifestyle. Recreational vehicles enhance every experience from camping, traveling to a concert, vacationing, your kids’ sporting events, and even tailgating. An RV gives you a boost when it comes to comfort and enjoyment level no matter your destination. 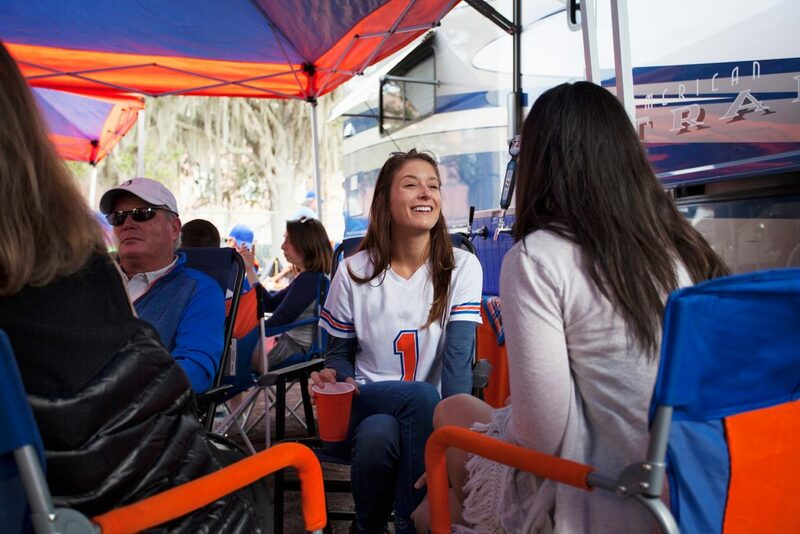 Jeremy, myself, and Courtney Robey of GoRVing set out to capture the essence of the elevated tailgating experience. As it always is with lifestyle photography, there is a level of finesse required to make the photographs appear natural and not posed. Through the efforts of Explore Media’s producer, we were fortunate enough to work with a group of real people, not paid talent, that were able to easily relax and enjoy the tailgate party while being filmed around their RV’s. Jeremy is a master at creating believable scenes, and coached our “ Talent ” into situations for his crew to film, while I worked alongside them capturing the essense of the RV experience. I also directed and shot my own scenes independently while Jeremy and his crew were off setting up for the next shot. It was harmony in motion! Perfect weather, great friends, and good food ( and a great crew! ) made capturing authentic and spontaneous shots a breeze. We focused on highlighting the collective sense of enjoyment and camaraderie you find outside of any athletic event - especially a collegiate one. We focused on not only capturing the crowd enjoying the party, but subtly highlighting how an RV allows fans to tailgate in a whole new way. With an RV, fans can set up an outdoor living room with seating, televisions, cold drinks and hot food. There weren’t any wardrobe changes for this shoot, but there was a considerable amount of post-production editing that we were hired for to remove the team logos from clothes, tents, etc. We were all happy with the end result and that each photograph showed people of all ages enjoying the tailgate party. Take a look at Jeremy’s work on Twitter @ExploreMediaCo and @jeremypinckert. On Facebook go to @exploremediavideo , and on Instagram, exploremediaco. I know you’ll love his stuff!